The film's release is still months away, but the trailer has already created a buzz. And judging by the trailer, whatever the final commercial and critical verdict on Shah Rukh Khan's forthcoming science fiction Ra.One, it will go down in Indian film history as the movie which has used computer generated visual effects footage the most in Indian cinema so far, putting even last year's Rajinikanth blockbuster Enthiran or Robot in the shade. Hardly any of those who have seen the trailer are discussing Khan's looks or his performance in Ra.One, short for Random Access - Version 1.0, or the plot. Everyone is gushing about the film's visual effects, or VFX. Even Hollywood is impressed. "New minute of Captain America visuals pales in comparison to the 10-second Ra. One teaser," says Movieline, an international website that reviews film trailers. So too director Shekhar Kapur, whose Mr India made in 1987 was one of the first Indian films to use VFX, tweeted: "Shah Rukh's Ra.One has raised the bar on VFX technique in Indian cinema... Hope other filmmakers catch up!" Ra.One is a pointer to not only the levels of excellence achieved by the Indian VFX industry, but also to Indian cinema's increasing use of VFX technology. 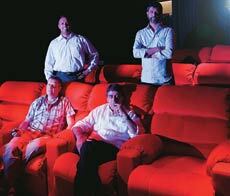 For many years, Indian VFX units catered mainly to Hollywood and ad film makers in India, with feature film directors - barring a few exceptions - keeping their distance. Suddenly, attitudes have changed. Among the high-profile films of late that used VFX extensively are Chandni Chowk to China (1,500 VFX shots), Aladin (1,600 shots), Blue (800 shots), Guzaarish (350 shots) and above all, Enthiran (2,000 shots). Currently, industry insiders estimate around 70 per cent of Indian films are using VFX. "In Bollywood, VFX has evolved only in the last five years," says Merzin Tavadia, co-founder and Chief Creative Director, India, of Prime Focus, a leading VFX and postproduction studios that is working on the 3D conversion of The Phantom Menace of the Star Wars series. The first Hindi film to do so on a large scale was the 2008 release Love Story 2050. "It had 1,200 VFX shots. The film bombed, but the VFX was something Bollywood had never seen before," Tavadia adds. Indeed, even the subsequent Indian films that relied heavily on VFX had mixed fortunes at the box office. But all that changed with Enthiran, which was a tremendous success, raking in Rs 350 crore worldwide. And now there is Ra.One, which industry sources say has around 3,500 VFX shots, outstripping not only Enthiran in this respect, 2008 230 but even the much-discussed Hollywood blockbuster James Cameron's Avatar, whose score was around 2,700 shots. Haresh Hingorani, its VFX supervisor, says: "The most difficult of shots in Ra.One were the ones that required Shah Rukh's 'suit enhancement', which means combining actual shots taken using a camera with VFX shots. There are 800 suit shots and it took us five months to develop the pipeline for them." 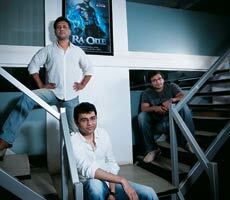 VFX studio owners say the mindset of Bollywood directors is changing. They are realising the enormous possibilities that VFX opens up, especially for science fiction, adventure and mythological films. "VFX is no longer an afterthought," says Sanjot Sonalkar, Head, Creative at Reliance Media Works, or RMW. "It is serious business. Earlier film producers would come to us and ask what stock VFX shots we had. They wanted to choose some and incorporate in their films. We don't have that situation now." "Most filmmakers horizons have expanded," adds Viral Thakkar, VFX Supervisor at Pixion, a post-production studio. "They are now capable of thinking and writing scripts around VFX. They are also becoming more confident that post-production studios can deliver the kind of work they are looking for." The effects have become so creative that they blend well into films, adds Sanjay Yashroy, Chief Operating Officer, Pixion. "The audience does not realise VFX is being used." Even so, Bollywood (Ra.One is an exception) has some way to go before it catches up with Hollywood. For a VFXdriven film, rarely do Indian producers budget more than 10 per cent for the effects, while their Hollywood counterparts could earmark as much as 60 to 70 per cent. Then, there is the size of budget, itself. Hollywood studios can spend $200 to 250 million on VFX alone, while the entire budget of Enthiran, for instance, was around Rs 160 crore or $36 million. "We tried to deliver visual effects of international standards within budget constraints," says V. Srinivas Murali Mohan, the film's VFX supervisor. Again, to get the maximum impact out of VFX in films, detailed pre-production - the work that goes into filmmaking before shooting starts - is a must. Here too, Bollywood lags well behind Hollywood. "Pre-production means the development of the concept and the use of pre-visualisation," says Neil Cunningham, Creative Head, VFX, RMW. VFX expert V. Srinivas Mohan (left) and make-up artiste Bruce Fuller check if actor Rajinikanth's head (protruding from a box below, inside which the actor is seated) can be successfully shown as attached to a skeleton. The trilingual Rajinikanth starrer Enthiran, released last September, used visual effects in ways never seen before in Indian cinema. A blockbuster, it grossed over Rs 350 crore globally. Though director Shankar primarily used the services of the Chennai based VFX studio Indian Artists headed by V. Srinivas Murali Mohan, he also roped in experts from Hollywood, Frankie Chung and Eddy Wong, as well as a host of freelancers from across the globe. The film had 2,000 shots, adding up to 40 scenes, which employed VFX. "We used technology never employed before in India such as Doom Light stage scanning. The system efficiently captures the way an actor's face appears when lit from every possible angle. From this captured image, specialised algorithms create realistic virtual renditions of the actor on any given location or set reproducing the colour, texture, shine, shading, and translucency of the actor's skin," says Mohan. Enthiran also employed animatronics - the use of electronics and robotics in mechanised puppets to simulate life - roping in Hollywood's Stan Winston Studios, which created the effects seen in films like Terminator and Jurassic Park. Chitti, the robot, was the film's biggest USP. "In Hollywood, once scripts are written in which VFX is an integral part, the process automatically takes over." Not in India. Enthiran, says Mohan, spent six to seven months on pre-visualisation. "Indian cinema is still raw in the way it views VFX," says Keitan Yadav, Ra.One's VFX producer. "For directors and producers, getting involved at the script stage and pre-visualising is not the norm yet. However, things are changing and Ra.One is an example." But there is a big advantage in using VFX for certain kinds of sequences that Indian filmmakers are finally waking up to: it can be economical. "It is much cheaper to create images on a computer screen rather than take an entire film crew to a location and shoot," says Pixion's Yashroy. "You are able to easily capture extreme situations that are difficult to shoot." For television shows, especially the mythological ones, where budgets are usually much tighter than those of feature films, VFX is a still bigger boon. Industry sources maintain using VFX rather than putting up sets reduces TV production costs by 60 to 65 per cent. Unlike films and TV, Indian advertising cottoned on to the benefits of VFX very early. In advertising, VFX has already come of age with almost 80 per cent of commercials today using VFX in varying degrees, according to those in the industry. They estimate that a 40-second commercial, which would typically cost Rs 40 lakh to shoot, can be made for Rs 30 lakh if VFX is used instead. "With around 15 million small and medium enterprises in India, the demand for VFX in advertising can be huge. This is good for the future of the VFX industry," says Mohit Ralhan, Head of Investments, Media and Entertainment, Baring Private Equity. "Many SMEs cannot afford TV advertising, as they find it too expensive to prepare TV ads. VFX-based ads can do wonders for them." (about a submarine disaster) have all used studios like Prime Focus, Pixion and RMW for high-end work. 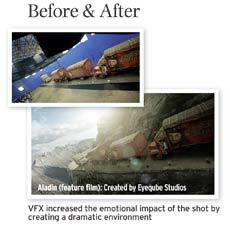 Prime Focus created a number of the visual effects seen in Avatar. It had a team of around 90 working on the film, spread across Los Angeles, Vancouver, Winnipeg and Mumbai. RMW has worked on projects such as The Chronicles of Narnia and is currently working on two 3D films slated for release later this year - Shark Night and Conan the Barbarian. "A lot of the work in Shark Night is over and under water, which is notoriously difficult to do in stereo," says RMW's Sonalkar. "In Conan, we have worked on a major set piece. We have built proprietary tools and rigs to tackle some complex VFX shots." The market for VFX in India stood at approximately Rs 450 crore in 2010 against Rs 320 crore in the previous year, an increase of 41 per cent. The overall industry comprising animation, VFX and post production grew by 17.5 per cent over 2009 to reach Rs 2,360 crore, according to a FICCI-KPMG Media and Entertainment report. The overall growth was largely led by VFX and post-production, the latter rising by 17 per cent. The report says that animation and VFX together are expected to grow at a compounded annual growth rate of 18.5 per cent to reach Rs 5,590 crore by 2015. 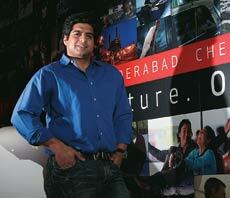 Baring's Ralhan is even more optimistic, expecting the VFX industry to grow by more than 25 per cent annually. "The next five years are going to be big," he says. Not just the next five - VFX will grow for many years to come. The sight of unbelievable events unfolding believably on screen is guaranteed to fascinate all, especially children. Back to Ra.One, which its director Anubhav Sinha admits is being made "as a treat for our kids". Shah Rukh's son Aryan is 13, his daughter Suhana is 10, while Sinha's own son, Shlok, is nine. "Ra.One is a father-son story. We wanted to do it for our children," concludes Sinha. Movies like Sanjay Leela Bhansali's Guzaarish and Sujoy Ghosh's Aladin used a good number of VFX shots. While Guzaarish's effects were created by the Prime Focus team, headed by Merzin Tavadia and Reupal Rawal, Aladin was brainchild of Charles Darby of Eyeqube Studio. The fly sequence is the opening shot of the film. Actor Hrithik Roshan, who plays the paralysed male protagonist, tries to flick a fly off his nose. But the fly never existed, it was entirely a VFX creation. Tavadia says: "For this sequence, the team did an enormous amount of research on flies: how they look, how they move." The team then got down to the serious business of modelling the fly on computer graphics and texturing it. The challenge was to match its movements to those of Hrithik's eyes. After the sequence of movements had been locked, the team worked on lighting up the fly to match the actual shot with Hrithik. Aladin, starring Riteish Deshmukh and Amitabh Bachchan, had a total of 1,600 VFX shots with 150 artistes working on it. All the shots were conceived and executed by Eyeqube Studios in house. "The process was different as we covered the entire life cycle of visual effects right from initial development to final delivery of effects," says Charles Darby, its co-founder. "You will discover that this movie covers every conceivable kind of VFX - 3D, 2D, matte paintings, computergenerated environments and character animation." Aladin is unique in its complexity and stands out for its seamless integration of VFX into the narrative. "The film would have been impossible without VFX. Not only the magic elements, the sets were also made to look much larger by the use of invisible work," says Darby.